I'm getting ready to buy an external hard drive for backups, but I'm confused by all the terminology when it comes to connecting the drive. Should I go for USB, Firewire, or eSATA? What are the pros and cons of each? eSATA stands for External Serial Advanced Technology Attachment. It is a standard for a connector between a computer and an external device, such as a hard drive or CD/DVD drive. Similar standards include USB (Universal Serial Bus) and Firewire. The thing about eSATA is, it's faster than any other common external device connector. An eSATA connection transfers data up to four times faster than USB 2.0 or Firewire 400. In the real world an external drive using a USB 2.0 interface will reach data transfer speeds of 20-30 MB/sec, versus up to 300 MB/sec for eSATA. Additionally, some features of SMART drives may not work over USB or Firewire, but they will on eSATA. An eSATA port is not standard equipment on all computers. If your desktop computer does not have an eSATA port, you may be able to add one in the form of a card you plug into a peripheral control slot on the computer's motherboard. Laptop users can add eSATA ports with Cardbus or Expresscard cards. If eSATA is so much faster, then why don't we see eSATA on every computer and external device? The main reason is that an eSATA link cannot supply power to an external device, as USB or Firewire can. Therefore any external device connected via eSATA needs its own power supply. That limits eSATA in competition with USB and Firewire when it comes to the size and portability of devices that can be used with it. You won't see an eSATA thumb drive, for example. But for external CD/DVD drives, a power supply is necessary no matter what link to the computer is used. So an eSATA external drive makes sense if you want the fastest possible data transfer, as in backup/restore operations of copying large files for physical transport to another location. You can use a cable up to six feet long with an eSATA connection. That's long enough for most purposes, but if you need a longer cable you will have to use USB or Firewire. When buying an eSATA cable, be aware that it is not configured the same as an internal SATA cable, and an internal SATA cable's plugs will not fit eSATA ports on your computer or external drive. 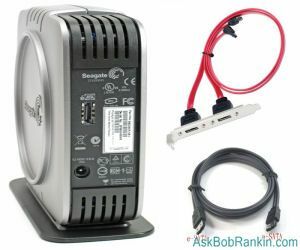 Whether SATA will ever add the ability to supply power to an external device is unclear; it's on the agenda of the standards body that develops the SATA standard, but products that incorporate "power over eSATA" are slow coming to market. In the future, eSATA ports will become more common on desktop and laptop computers as vendors add this feature to compete with one another. Also, the SATA standard, internal and external, will continue to improve in speed. The SATA 6Gb/sec standard will double the transfer speed of the current SATA-II spec. Look for eSATA devices based on this new standard to arrive in soon. In 2010, expect to see a battle royale between supporters of eSATA and USB 3.0 technology. The emerging USB 3.0 products promise data transfer speeds rivaling that of the new SATA 6Gb/sec standard, without the need for external power. Toss in Firewire 3200, and we're likely to see continued confusion in the marketplace. The most likely scenario is that vendors will offer external drives that offer all three connectors. Most recent comments on "eSATA External Hard Drives"
Just one point of note regarding the article though. Whilst the data transfer speed of eSATA is around 300 MB/sec as you mention, in the 'real world' the transfer speeds are limited by the physical read/write speed of the drive itself. Therefore, whilst copying a large file onto a typical 7200rpm external drive will be faster via eSATA than USB, just don't expect 1 GB files to be copied in around 3 seconds! Funny, I was just doing a little research on hardware backup solutions. I'm not interested in any online solutions; I want a home hardware solution. The problem remains, all hard drives will eventually fail, making them unsuitable for data archiving. I sure wish someone would come up with a solution. Which is pushing which, external storage capacity, or external transfer speed? Whichever, we keep seeing larger and larger drives being used for external data backup. Admittedly, hard drives are easier to use for data backup than CDs or DVDs. But, in the long run which is the safer storage medium? HDs are prone to fatal crashes, and CDs and DVDs supposedly deteriorate with age, so neither system is fool proof. How do the various external storage systems compare with each other in terms of probability of losing your data some day? So, don't advances like eSATA and USB 3.0 just help to set up users for a much more heartbreaking data loss some time in the future? Hey JM, what's the problem. Just make sure your files are always in two places. The chance of both drives failing at the same time is very slim. I backup my most important files at least once a week to a flash drive that I always carry with me (thank you TrueCrypt). All the other stuff (pictures, music, videos, etc) gets copied to an external hard drive every two or three months. Then it is put away in a safe place. I have an eSATA external hard drive and an eSATA connection on my PC. My computer sees my hard drive when connected via USB 2, but does not see it when connected via eSATA. Anyone have a clue what the problem may be? Hi, the driver for the esata controller (not standard in chipset) could be not, or not correctly installed. During setup of the operating system, these tertiary chips far too often have no WHQL signed driver (WHQL means Windows Hardware Quality Labs) and the driver is essential for making it work in the first place, and also for hotplug availability. Older "modern" systems have controllers not yet seen as native in OS, and some chips will never be seen as native because the OEM (manufactor) never bothered to adhere to standard, chose to not properly supply its HWID/ or chose to rename a subset in the driver making it clash with a native.. or has had chips built with variant mask for a specific motherboard/plug-in card. It means that you have to look up details of the motherboard and install specific drivers, and it also means you may have to uninstall newer drivers before older will take hold. It is a sorry state those driver writers keep us in, as standardisation costs effort and money? Have put an e-sata card in my 6yr.old puter cause the usb connection to my external hard drive was agonizingly slow. Now with the e-sata connection my external h.d. just screams. Can't believe it's not in my case. usb ok for thumb drives but no competition with e-sata and large file tsfs.